As I went long, and long big (and it's paying off handsomely) with $TaaS worth mentioning due to the time-constraints (below) another crypto-currencies FUND is launching, this one focused on machine learning/deep learning, as it's way of obtaining alpha. You may purchase the Beth Tokens only within the period of Beth Initial Coin Offering set out here. 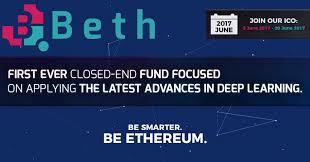 Beth Initial Coin Offering (ICO) – period of time from Jun 5, 2017, to June 20, 2017 (UTC/GMT), when the investors are able to buy Beth Tokens. During the ICO, 100% of the tokens will be distributed, that is, 20,000,000 of Beth Tokens (Total Supply). The number of the Beth Tokens allowed for purchase by one user is unlimited at fixed price of $0,50 per Beth Token. The Beth Tokens will be issued only once. The Beth Tokens will be Ethereum-based cryptographic tokens of value. Beth Tokens – cryptographic tokens, which are software product (digital resources), created us as a proof of membership of their holders in the Beth Fund. Profit distribution will be carried out using our Ethereum Smart Contract. The Beth tokens will provide to their holders a right to receive 60% of quarterly profits and 25% of profit will be reinvested back into the portfolio, this is 85% of the profits to the investors, nobody could offer something like this, but thanks to our focus and to Beth’s help we will be pioneers in many ways. 70% will be allocated a portfolio. 15% will be used to cover operations expenses. 15% of the capital will be used as Reserve Funds hedged in BTC and ETH. We will only accept BTC or ETH to buy Beth Tokens." Gather thy Bitcoins or Ether if interested. I was originally unable to access this site, for unknown reasons, I now can (perhaps changed/obtained legal advice to the BETH team has allowed them to open the opportunity up to peeps in the UK; take your chances if interested, where ever you live subscriber!)! I haven't invested yet, I just lost my most favourite way to buy bitcoin (uphold.com has temporarily stopped allowing VISA cards to be used!) 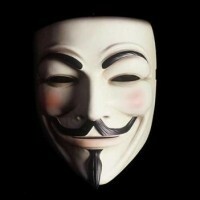 ... so am scrambling to get other ways other than just coinjar.com UP at the moment. Obvious points: invest on day one if you are going to invest at all seems sensible advice. Never invest (this is high high HIGH RISK stuff; bleeding edge) more than you can afford to lose. All that said speaking personally I was hoping perhaps THREE FUNDS might open up - so I could diversify my own holdings IN FUNDS, from just one fund holding ($TaaS) to more than one, three, minimum, ideally. This is the second FUND I've heard of so far. Note, only 70% of the value of any investment you make actually ends up in the fund; but it's paying out 85% in total, that's YUGE! Read on below, for more coverage of crypto-funds, crypto-currencies, crypto-asset trading n+MOAR!